We’ve seen a number of issues pop up in the 3.0 software since the launch of the EX490, EX495, and X510 Data Vaults. It appears HP is aware of the issues and already has the first patch out to address “critical defects in the Home Server Console, HP Media Collector, and other critical defects.” The patch includes updates for the Server as well as the Client computers, both PC and Mac. The patch is approximately 150mb in size and should be available via the Software Update feature in your Server Console. The file is named MSDV301433083ServerPatch.exe and would indicate a version of 3.0.14.33083. Note that this patch is only for the EX49x series of MediaSmart Servers and the X510 Data Vault running the 3.0 software. 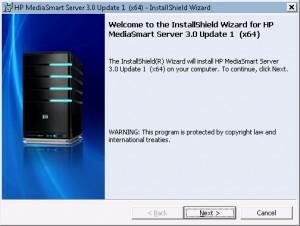 The Server Update is easily installed via the HP Software Update feature, and the installer will guide you through the process. At the end, the Server Console will be restarted and you should see the new version in the Status tab. You’ll also notice a Health Notification alerting you that your Clients need to be updated in order to gain the benefit of the new Media Collector fixes. The Client update is not quite as easy to install, unfortunately the Health Notification can only direct you to “uninstall and reinstall the client software” and is unable to facilitate the easy upgrade of the Client. I’d like to see HP work on improving this so that clients are as easily updated as the Windows Home Server process that allows automatic updates or one-click updates via the Health Notifications. I first tried to just install the updated HP client software by manually running the .msi file in \\hpstorage\software\Home Server Connector Software\oem\. This seemed to work, however the Server health notification was still active stating I needed to update my client. I then tried fully uninstalling via Add/Remove programs both the MediaSmart Server and Windows Home Server software, and reinstalling them from the server. This also installed just fine, yet the Server health notification is still active. I’ve not yet found a solution for this issue, and my only thought is that the server reports a version of 3.0.14.33083 while the Media Collector client file version appears to be 3.0.13.33055. This issue was resolved by restarting the “HPMediaSmartService”, a server reboot is the easiest way to resolve the issue. I’ve also found that, at least on my server, the “Rollback” option of the update is grayed out so I am unable to uninstall this update. Finally, I’ve unpacked all the install files and have been unable to find a Readme or any further documentation on what fixes might be included. HP has also declined to provide any additional details around what might be fixed in the patch, so if you’ve got any of the issues in our list let us know if they’ve been resolved in the patch. This looks to me that HP has rushed this out the door after after the userbase with the annoying bugs continues to grow. It looks like some issues may be fixed now but others (client upgrade issues, health status …) are now appearing. I am holding off on this update for a little while longer. Hi Lars, I’ve updated my post to show that I’ve resolved the Client Health/version issue by rebooting the server. Personally I expect this update will resolve issues that I’ve been experiencing and I’m glad HP has released it, even if they won’t tell us what they fixed. :/ I’ll keep after them with our list of bug fixes in the forum. I updated the server and the MAC clients, but I can’t get back into my server. Help! I did the update and all went well. I put a few screen shots at homeservershow.com. The console was still convinced the clients had not been updated but that is minor. This is a new 495 with ZERO add-ins installed. It should go well! I’m about to go through my list of Add-Ins and start installing. Thanks for the heads up Alex and thanks for everyone’s help this last weekend on my 495 install. It was an adventure for sure. Lee, I noticed that Twonky was hammering my server for quite a while after the patch update, presumably re-indexing things. Mike, we try to keep troubleshooting in the forums as that tends to be a bit easier to share screenshots and get the entire community involved. We’ll need to know what error message you are encountering, and what troubleshooting steps you’ve already tried. Ok – so not happy with this release! The console keeps crashing/freezing on me and the machine just won’t settle into an idle, processor state. Lee: same here. I can hear the HD(s) chewing on something, and it’s been like that all day. This is on a pretty-new ex490 w/ 3TB and about 20,000 photos using the media collector. No music or video yet. I just bought this machine a couple weeks ago and this is kinda unbelievable to me. I paid a premium thinking that HP would make this sort of thing a little more user friendly, but no. Sorry, but I’m steamed. What part is unbelievable? Software patches are commonplace, I’m glad they are improving the product. My EX495 is also churning away on HPMSSService.exe process (~40% CPU). What the hell is this thing doing anyway? Is everyone noticing this or is this an exception? So far this seems to be the exception, only a few users have reported it and I’ve not seen it on either my EX495 or X510. We’re on an investigative hunt here in the forums so chime in if you’re able to provide any additional clues! Since the HP patch, any time I boot up either of my PCs the drives on both the EX490 and the PC start thrashing and the server core temp shoots up to 50C (high CPU/memory utilization). Also, the automatic backups are flaky and even a manual backup doesn’t always work. Prior to the upgrade, server memory use was around 25% and CPU was less than 5% when idle. What the heck did HP change in that patch?! I’ve had the MSS about a week and it’s just about useless now. Sometimes it even interferes with my PC shutdown unless I kill the server first. I am NOT a happy user. I’ve had the same problem since the update. I’m experiencing above normal CPU temps and 100% cpu usage at all times. I’ve called into HP support a few times now and they are aware of the problem but don’t have a fix quite yet. This problem I’ve been told is only affecting EX49x servers. I also attempted a system restore at the reccomendation of HP with no success in the end. I also have pictures and videos stored on my server but have no ideas as to what is happening. Backups do take several days and some fail. The console frequently locks and freezes. I sure hope they fix this soon as I have not been able to use my server since I purchased it. I’ve been told to keep the server off until an update is released. I’ve been told to keep the server off until an update is released. I’m very disappointed to hear that, not at all what the owner of a new product should expect to hear from the HP support team. Thanks for sharing your experience. Has anyone else contacted support and received similar guidance? Same issues, just got my EX495 two days ago, the errors for the updated clients won’t go away, and its constantly running at like 90% processor and 50C. After it finished indexing the music database then it dropped back down to 5% processor. I’m keeping an eye on it. I am also have the same problem. I had to rollback the client software on my Mac to the default software. Everything seems peachy on the server side. I hope they find a fix for this because I’m about to put this thing up for sale and get one of those Mac Mini’s with Snow Leopard Server. If you’d like help troubleshooting connectivity issues I’ll request you sign up in the forums, we’ve got several experienced members helping out with issues there. Not to get off-topic, but the Mini server isn’t really a direct competitor to the MSS or WHS, you lose a lot of functionality and expandability, all for increased cost. Meeting your needs is the most important factor, though. I found this page after searching for “HP Media Collector – Please Update the Client Software” and following a link. I have the EX490. I wasn’t sure if, once I’d removed the HP MediaSmartServer and WindowsHomeServerConnector s/w from my PC, I’d still be able to connect to the EX490, so before-hand I copied the EX490′s \SOFTWARE folder to my local PC. (In fact I don’t think the copy was necessary because mapping folder-shares still worked). Then I ran WHSConnectorInstall.exe, which installed both pieces of s/w. Then I restarted the EX490, and the Red (critical) status has gone now. So thank-you for this web-page: it solved the problem. This might just be coincidental, but before the s/w upgrade to my PC, I noted the EX490 was typically using 50%+ CPU, whereas now it is idling along at <5%. I'll have to look to see if there's a way to monitor what the EX490 is doing when CPU usage is high (when I'm not actively using the EX490). Hey guys – I had a couple of the issues described here after I installed the patch. Eventually, I had to back out of the upgrade and have stayed at 3.0 until they are ready for a release that addresses the resulting issues some of us seem to have. I spoke with HP support tonight about a problem I’m having with the Photo Viewer – and asked if another build is expected (and if they acknowledge there are users with legit problems). I was told that they absolutely realize that the patch caused additional issues fro some users, and that a “fix” is in the works and should be released in the near future (no exact time table). Hi Keith, thanks for the update! Any updates about HP’s patches? I have a uk x510 on back order at the mo and wondering which version of the software it’ll come with tbh, it’s been delayed several times. Any further info from HP about the updates/patches? I have a UK spec X510 on back order at the moment and am wondering what version it will turn up with tbh. Though my unit has been delayed several times. There’s been no new patches nor news of patches. I have just purchased the HPEX490 and have it installed. I am exhibiting the “HP Media Collector – Please Update the Client Software” error. I have installed HP’s latest 3.0.14.33083 update to no avail. I have yet to uninstall/reinstall. Also, the HD sounds very active as explained above, like its cracking corn nonstop. I am now getting frustrated since I cant yet fix these problems. I paid 460.00 for something, it shouldnt have problems that require so much research and fiddling around to get it going. Considering an RMA. DO you have any suggestions….I would appreciate them very much…….Thank you for your time. This will run an installer that copies the matching client versions from your server and installs them on your PC. You must do this on EVERY computer you have on your home network. I believe the server misbehavior is the result of a mismatch between the client software and the server software. Although it does function, it causes the server to thrash any time one of the PCs is running. I too have just purchased a mediasmart WX 490. Setup went fine but after completing all updates and adding media I encountered the same problems mentioned above, ie HP media collector error and the server cpu running constantly at 30 – 100%. I am trying to decide whether to give up and return the server or whether to persevere and hope a fix appears soon. It is however comforting that I encountered this forum with people having similar issues. Bought mine a week ago. It even crashes my client PC. So this is a nonworkable situation. Thanks for posting this. Just installed my EX490, everything was going fine until I had a network health alert about 90 minutes after I started setting up the server. This was useful, I’ve installed the client software updated, rebooted my server and all looks fine. Thanks again! Should the server be kept on all of the time. I have noticed that on each reboot there is a lot of cpu / hard disc activity for a couple of hours – what is this doing, is it indexing and if it is why doed it have to carry out the same activity on each re-boot. 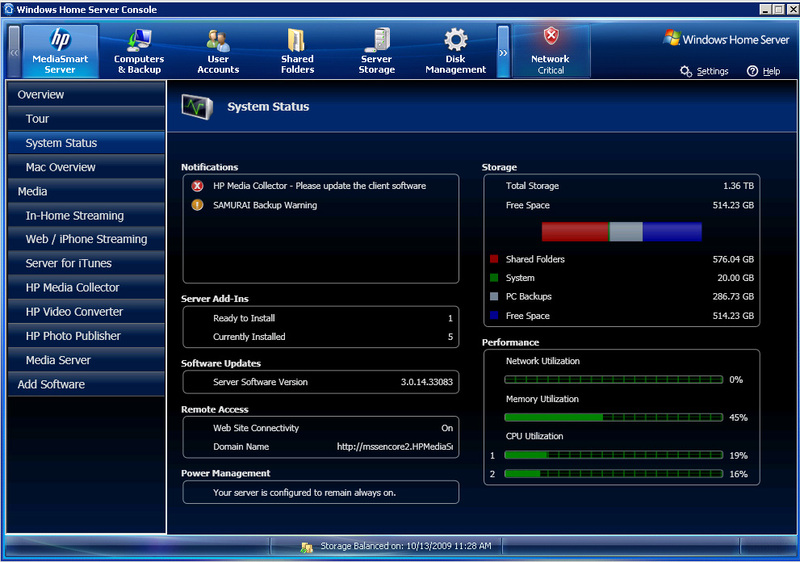 Lastly how can access the server’s task manager to see what is going on. Hi Alan, those are some questions that would probably be best answered in the forums, and you may want to use the search feature of the site first. Here is one topic on whether to leave your server on all the time, there are several others. I’ve had my ex485for almost a year now. I’ve battled the high CPU usage issue several times. Twonkymedia is the culprit. Uninstall it and everything idles right down. If you reinstall it, be sure to delete the Twonky database first, otherwise when you reinstall, Twonkey starts the index process anew and gets itself all confused with the old db file left behind when you uninstalled. I recently dropped an E5200 Intel dual core into my ex485 hoping that it would have enough power to actually make remote streaming useable. It helps, but I’m still not happy with the performance. I originally bought the HP WHS instead of building my own so I could setup the streaming for friends and family to view content on the server. After many painful attempts and days of searching for answers I’ve come to the conclusion that this application really demands more processing power than these severs have. Performance does improve after long periods of indexing data if you wait for it to finnish. just setting this all up and getting it to run is a task not for the faint of heart. To the contrary, the only posts I’ve found are users who just uninstalled Twonkey, so that the server could then be used for its other functions. Until someone shows me the error of my ways, I must conclude that Twonky and HP’s claims as to what can be done with these systems in terms of media streaming, are greatly exagerated. Maybe if I cut my media library to 10% of its current size it might help, but I’m nowhere near the size of what Twonky claims can be handled by the software on their website. I don’t know about others, but I’m VERY dissapointed regarding the misleading claims made by HP regarding these features. To think they even had the audacity to name it a “MediaSmart” server! Ah … the irony of it all. Someone please tell me I’m wrong and that it’s my own stupidity that’s keeping me from getting what I thought I paid for. I have a brand new EX490. 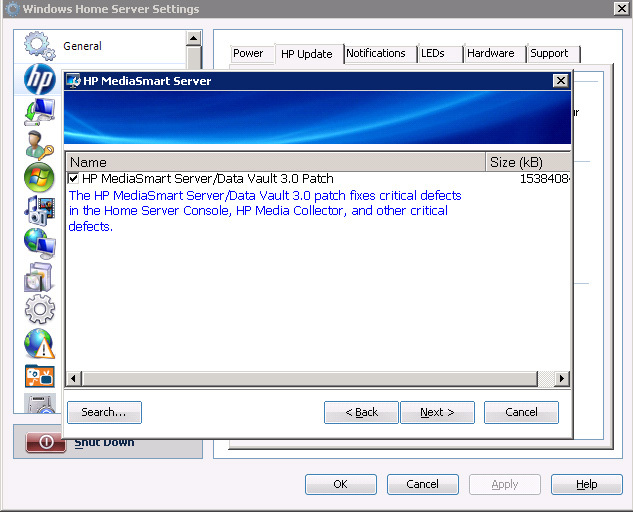 After setting up the server, I immediately got the error, “HP Media Collector – Please Update the Client Software”. I was running the latest update 3.0.14.33083. As like others, I reinstalled the client software and it didn’t resolve the issue. 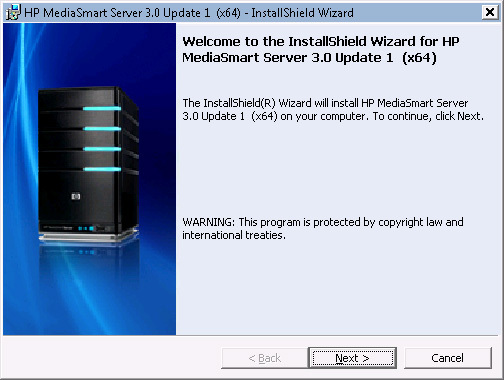 So, took Alex’s advise and restarted the “HPMediaSmartService” along with a server reboot… Viola…. the error is now gone. So, good tip!! I understand v3 is out, but what about the EX48x folks!? HP is definitely not going to open this latest update to us that have a very slightly older machine? Anyone know the reason why they didn’t let this patch get applied to the ex485, for example? Brian, please see this blog post. Hi Guys.. Brand newbie to this HP MSS. CPU is hung at 100%. I’ve learnt plenty from all your good posts guys. Seems Twonky Media is wonky at best. Thanks to all and Alex.